So, I'm told that, occasionally, people will have parties where they play games. I just have to take y'all's word for it, solitary creature that I am. One such game played at parties like this is Charades. But that can get kinda boring, so why not liven it up some by mimicing your favorite animals and the strange ailments they might get? That's what you'll be doing in Animal Ailments. The game is up on Kickstarter now. A Gorilla with Brainfreeze?! A Hyena with a Hangover?! Act out ridiculous combinations in this hilarious family friendly party game. It’s just launched on Kickstarter, funding over 40% on the first day. 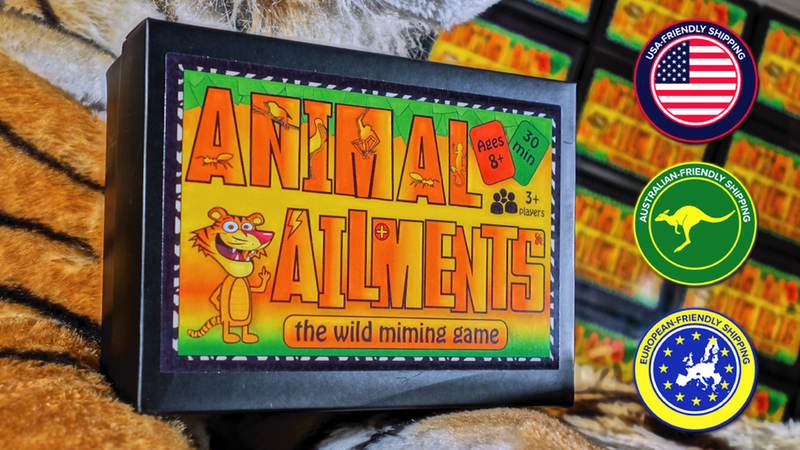 Designed for 3+ players and suitable for ages 8+, the game takes around 30 minutes to play and easily livens up the most boring of parties or family holidays! Simply take a green card, and a red card. Mime your animal first, then your ailment – but no speaking! Guess the Animal Ailment together to win points. Steal cards from your friends through additional mime. Special PowerUp and Penalty cards create a competitive yet simple gameplay that everyone can get involved with! The campaign's about halfway to its funding goal with still 33 days to go.